Sewage is one of the most dangerous substances found in a home or business. If it is exposed on your property, it can cause serious health risks. Sewage has many different types of bacteria, viruses, and disease-causing fungi. Because of these health risks, it is important to have sewage cleaned immediately. Multiple factors determine the level of contamination with sewage backups and spills. To help minimize your loss, we follow this process. Thorough inspection of the structure to determine what type of materials are affected and how deeply contaminants have penetrated into structural materials. Implement appropriate procedures to prevent further spreading of contaminants such as isolating affected areas. Take psychrometric measurements to establish drying strategy to be followed. Disposal of non-salvageable porous and semi-porous affected contents. Clean and sanitize all the affected surfaces and salvageable contents. 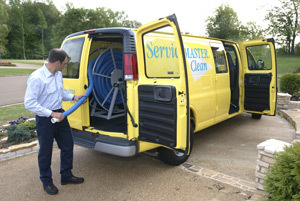 If you have experienced a sewage spill or backup in your home or business, call ServiceMaster by Gadonniex immediately for professional cleanup. We are available 24 hours a day, 7 days a week. Our certified technicians will arrive quickly to prevent any further damage.